We're geared up to Think Pink, but did you know that October is also AIDS Awareness Month? With our pink ribbons pinned to our chests, we're showing the world we support the important fight against breast cancer. But as we're doing so, many of us are leaving an equally important gap above our hearts. 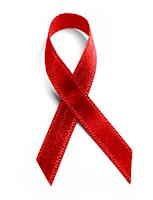 Make room for a red ribbon -- one that symbolizes the fight against AIDS -- especially for those children with AIDS who aren't able to fight the battle alone.